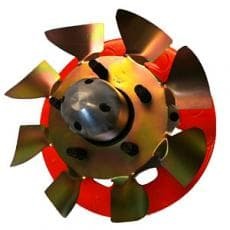 Ultra Cool Brake Fans - Circle Track Supply, Inc.
Ultra Cool Brake Fans has developed a patented solution for a common problem of brake failure in the racing industry, the lack of sufficient heat dissipation from the braking system. Its design has proven to be very effective in the removal of heat from the rotor, preventing the thermal heat build-up in the braking system. Some features of Ultra Cool Brake Fans include the ability to cool the wheel side of the brake caliper and rotor, helping to prevent brake fade and rotor warp. Ultra Cool Brake Fans also decrease pressure under the car, thus increasing down force and air flow through the radiator. Because of the efficiency of Ultra Cool Brake Fans, often times the need for conventional brake ducts and blowers is reduced or eliminated. Simply install the one-piece Ultra Cool Brake Fan between the hub and wheel and see results.